Take washing your dog to the next level! At Ben’s, you can spend precious time with your pet while taking the hassle out of giving them a bath at home. This do-it-yourself wash system lets pet owners groom their pets in a fraction of the time it normally takes at home and, not to mention, it cost less and it minimizes the mess! What's included in a Ben's Barketplace dog wash? 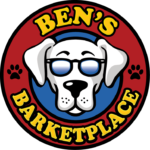 How does the Ben's Barketplace Dog Wash work? 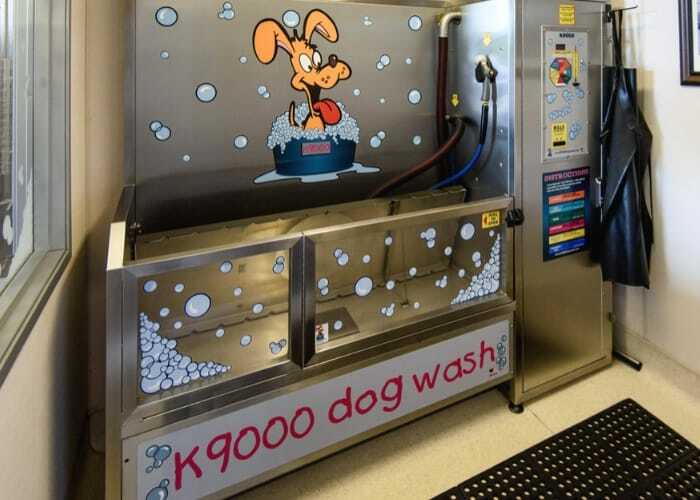 The Ben’s Barketplace Dog Wash is designed to be familiar to the user and is very similar to a self-serve car wash. Once you insert your payment, the timer will register 10 minutes. It allows you to use the time in any way that you choose. You’re able to switch back and forth between selections or spend the entire time on one. All the products (shampoo, flea/tick shampoo & conditioner) are introduced into the water stream through the nozzle, allowing for most dogs to be washed in a matter of a few minutes. It usually takes 3 or 4 minutes to wash a large dog and then most customers utilize the remaining time on drying. If there is more time required just a one-dollar for each additional minute. What shampoo and product selections are available ? The dog wash includes Berry Clean Shampoo, Neem flea and tick shampoo, Kiwi Conditioner and Kennelsol Disinfectant. There is also a rinse and blow dry cycle. The blow dry cycle features a two speed commercial grooming dryer. May I use my own dog shampoo and products or do I get those from you? It’s fine if you choose to bring your own shampoo and conditioner, but please DO NOT apply flea/tick products in our store. We never recommend these poisons for your dog. Let us show you all-natural solutions for fleas and ticks instead. May I wash my dog if he was sprayed by a skunk? Sorry, but no. Please DO NOT bring your dog for a wash if he has been in contact with a skunk. We would be happy to provide you with a skunk shampoo ingredient list, but these dogs must be washed at home. How do I keep my dog in the dog wash? There are tethers on either side of the dog wash. Also, the sides are high enough that most small and average size dogs won't try to jump out. How do I pay for the dog wash? Our self-serve dog washes accept U.S. currency, or they are programmed to accept tokens which can be purchased at the checkout counter. Why spend a fortune getting your dog groomed? The truth is that you don't want to bathe your dog more than once every six weeks. You don't actually need to groom your dogs as often as they recommend. Why? Dogs don't have pores like we do and rehydrate their skin through their hair follicles. Soap is too astringent on their skin, and shampoo with oatmeal will cause even more itching. Using a soap-free shampoo is always best.